How about getting married in the skies? If you are a fan of extreme sports, this might be just the right wedding venue for you! If you are excited by the thought of it, we have good news for you – there are places where you can actually get on a hot-air balloon together with up to 10 wedding guests and say “I do” while heading to the sky! A logical alternative to getting married in the sky is getting married under the ground… in a cave! If you and the groom are cave lovers, you may find it interesting that there are certain caves where weddings are accepted, so you have nothing else to do than put on your special equipment and dive in the depths of a cave to get married like people did thousands of years ago. Except that you’ll be wearing a much nicer (and more expensive) wedding dress. Tired of beach weddings and hen parties by the pool? There’s always an alternative to that! 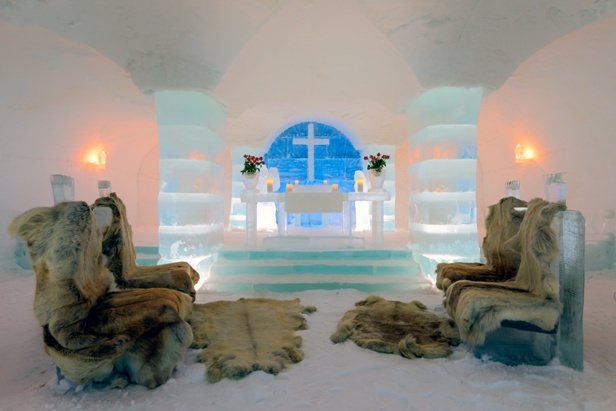 Why not surprise all your guests with a freezing trip to a glacier? They will be thrilled to participate in this one-of-a-lifetime experience including a cruise ship and even a helicopter ride. What you should consider: high heels and glaciers don’t exactly go hand in hand – if you decide on a glacier destination wedding, you should find a wedding dress that matches your special clunky boots with spikes on the bottom. Do you like fairy tales? Does the groom treat you like a princess? Then a real castle might be the best wedding venue for you! You can arrange the whole wedding around this unique wedding venue, incorporating the setting, an appropriate dress code, etc. The thing you shouldn’t worry a single bit is the pictures as most castles provide plenty of beautiful settings, including balconies with breathtaking views and gorgeous endless gardens. Are you a fan of the sea? Have you always dreamt of getting married on a boat? Today you can make this dream come true by choosing one of the most unique wedding venues – on a boat, a yacht, or even on a cruise ship! One thing’s for sure – your photographer will fall in love with the idea to create some masterpiece photos on such a romantic and unusual setting!